The first thing of INDUSTRIAL PARK‘s self-titled EP that attracts attention is its coloring, respectively the lack thereof. Industrial Park is overly white. 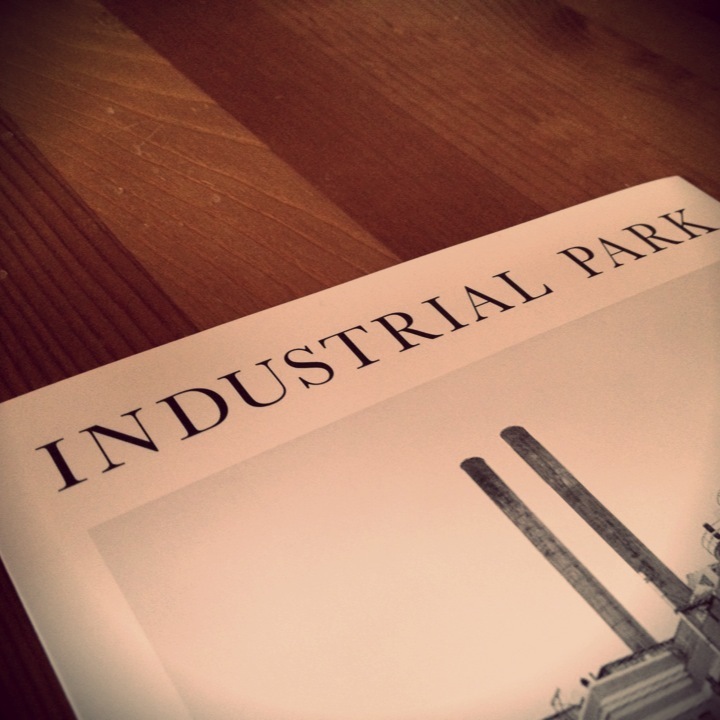 The front cover, as shown in the pictures, is white, featuring only the band’s name and a photograph of an abandoned paper mill. The back cover: white, only giving the titles of the songs – Echoes and May – and little information about label and band. Getting the record out of the sleeve one finds white labels which have nothing more than “A.” and “B.” printed onto them. And the present version of the vinyl record itself is also purely white, although there exist different colored versions as well. However, white is obviously the determining element of the record’s appearance. As a consequence thereof Industrial Park looks neat and clean, even elegant, which is an antithesis to the record’s (and band’s) name. Industrial parks, no matter if abandoned or still in operation, are usually worn with use and considered to be functional and mostly dirty places. Thereby INDUSTRIAL PARK reverts these attributions and gives the term the chance of a retrieved meaning. “Industrial park” becomes a new concept to be filled with content. This dreadful nature of white that Melville describes so eloquently is definitely present in INDUSTRIAL PARK‘s EP cover, especially in regard to the music that transports a certain gloomy, uneasy feeling as well. The songs of this self-titled EP aren’t new. They can also be found on the band’s debut EP Cold White, which was released in 2012 on strictly limited cassette via Aqueduct Records. Anyway Echoes and May are incredible haunting, tense tracks that have references to Dark Wave like Sisters Of Mercy and incorporate the attitude and feeling of highbrow No Wave à la Sonic Youth as well as the asperity of Post-Punk like Warsaw or Siouxsie and the Banshees. The outcome however doesn’t sound like any of these bands, but like an extracted essence of the more artistically minded, darker sounds of the early to mid 80ies. Due to the performance as a two piece (only electric guitar, drums and vocals) INDUSTRIAL PARK is quite rough and unpolished, but not aggressive or sloppy. Emma Barnett’s somber voice breathes the words over raucous power chords, the simple riffs and drum patterns (the latter by Nick Makanna) keep things steadily going without craving too much attention of the listener. Somehow Echoes and May embrace you like a cold fog, provoking a palpable anxiety as well as a certain suspense that won’t be dissipated. In 2011 we lived in a big house with our best friends. […] It was in May that we all moved out of the house. Some of us left Portland and some stayed. Regardless, it felt like the dissolution of an epic group of people and the end of an era. It was sad. May commemorates that. Echoes on the other hand could be about almost everything. Given the sinister atmosphere that is present in the song one might think of the movie Stir of Echoes with Kevin Bacon – but that’s really nothing more than a mere thought. INDUSTRIAL PARK‘s vinyl debut, which was released by Toxic Pop Records, is despite its brevity an astonishing record. Just like the band’s name suggests it is the perfect soundtrack for a trip through the decayed, half-abandoned industrial area of your hometown on a grey, rainy day – bleakness rarely sounded better.